Friday, April 10 1908 -- Preparations continue for fleet week, and part of the celebration is to be an extravaganza of amateur boxing matches to entertain the gobs. Under the direction of DeWitte Van Court, a huge boxing platform setup has been constructed in Chutes Park for the purposes of reviewing and training a big crop of amateurs, and the main ring will then be used as stage for the actual contests, too. Because Chutes Park is also used for Angels' baseball games, the whole platform is portable, and can be stashed out of the way of the games as needed. 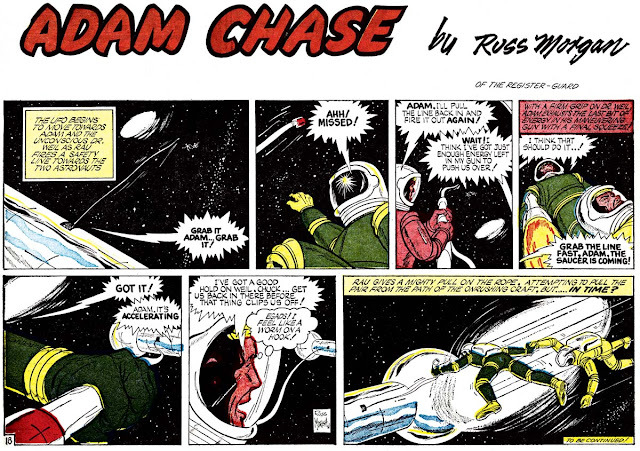 Adam Chase strip #18, originally published October 2 1966. For background on the strip and creator, refer to this post. Since leaving college in my junior year, I have been cartoonist on the Boston Traveler and the Boston Herald. At present I am with the New York Globe. I am also studying playwriting. I was married June 8, 1907, to Florence Judd, at Brookline, Mass. Donald, born April 5, 1908. Permanent address: Associated Newspapers, Singer Building, New York, N.Y.
Donald Crassous Bartholomew was born at Bloomfield, N.J., October 31, 1882. His parents were Frank Bartholomew and Adele Sanderson. He prepared for college at Stone's School, Boston, Mass., and was in college from 1902 to 1905. He married Florence Judd, at Brookline, Mass., June 8, 1907, and had two children: Donald, born April 5, 1908, and Elise, born June 20, 1912. He left college at the close of his junior year. At that time he was doing cartoon and assignment work on the Boston Post, signing himself "Bart". He continued his work on this paper while accepting a position of assistant advertising manager for Filene Brothers Company, in Boston. He remained with Mr. Filene one and a half years and left that concern to open a general advertising office. At this time he became advertising manager for the White Cross Milk Company, continuing his newspaper work on the Boston Herald, where he produced a popular Sunday comic under the title of "George and his Conscience." In 1909 the family removed to Brookline and he launched a mail-order bookbinding business which he ran for some time. In the fall of 1911 he received an offer from the Newark (N.J.) News and the family removed to New York. Bart remained on this paper several months, when he accepted a position on the New York Globe. He drew and wrote daily articles while on this paper. Bart remained with the Globe until late spring, 1913, and left to join the Associated Newspapers of the Hearst Syndicate. It was the dream of his life some day to write a play and with this goal constantly before him studied and read at every opportunity. In the fall of 1913 he wrote and had accepted his first story: "My Uncle and the Green Parrot". This story appeared in Collier's for October, 1913. His second story was in preparation at the time of his death. The family had removed to White Plains in the summer of 1913, and it was there that Bart died suddenly, December 19, of pneumonia. He illustrated: "The Excuse Book", "The Cook-ed Up Peary-odd-ical", and "Around the Clock with the Bounder". [Donald C. Bartholomew was not found in any census records. 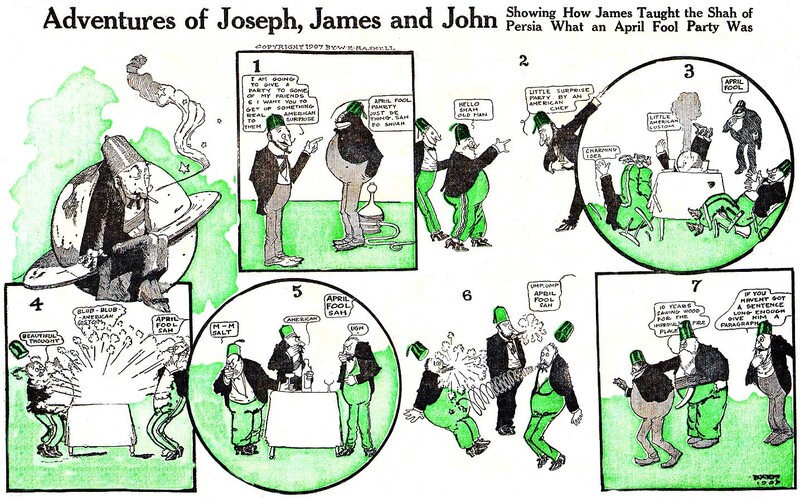 One of his strips was the Extraordinary Adventures of Joseph, James and John. The New-York Tribune (New York) reported his death on December 21, 1913. 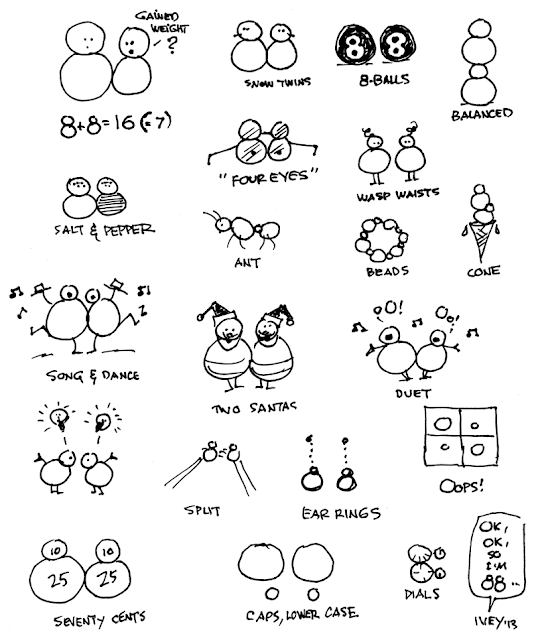 Donald C. Bartholomew, a cartoonist, died Friday at his home, No. 23 De Kalb avenue, White Plains, from pneumonia. He moved in August to White Plains from this city, where he was a cartoonist on "The Globe" staff. His work was signed "Bart." Hugh Doak Rankin was born Hugh Dearborn Copp in Loda, Illinois on July 2, 1878, according to a family tree at Ancestry.com. The same birthdate was recorded when he enlisted in the army during World War I. In the 1880 United States Federal Census, he and his parents, William and Ellen, were part of his maternal grandfather’s household. His father was a dry goods merchant and his grandfather a physician. They resided in Loda. Copp, Mrs. Helen Rankin, sculptor, born in Atlanta, Logan county, Ill., 4th August, 1853. She is descended from Scotch and German ancestors, who took a leading part in freeing America from the British yoke and from the curse of slavery. Her paternal grandfather, John Rankin, was one of the organizers of the Abolition movement. From her earliest childhood she dreamed of art. Stories and histories of artists were her favorite reading, and she tried to work out her dreams. It was weary labor, for the result was so far from her ideal. The few pictures the little country town afforded were but dreary disappointments. When she was five years old, her parents moved to Loda, Ill., where she passed her childhood and early womanhood. At the age of eighteen she attended the opening of the Chicago Exposition and for the first time saw a work of art. She returned home with renewed hope to the work of finding a way in the dark. In 1874 she became the wife of W. H. Copp, of Wolfboro, N.H., then engaged in the mercantile business in Loda. 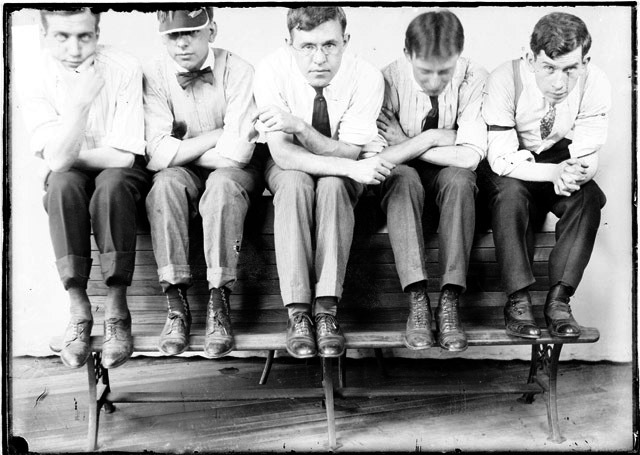 In 1884 they moved to Pullman, Ill., with one son, leaving four sons lying in the little prairie cemetery. The years of working in the dark were ended. In 1888 Mrs. Copp entered the Art Institute of Chicago. There she soon discovered that sculpture was her forte. Abandoning all thoughts of painting, she plunged into the study of modeling and anatomy with a desperation born of the knowledge that half a lifetime was gone. Entering upon her work at an age when most artists begin to achieve success, she rapidly surmounted all difficulties,, allowing herself no rest, even in vacation, and carrying off the honors of her class, until 1890, when she received the only medal ever given by the Art Institute for sculpture. Her instructor said that she had accomplished ten years’ work in three. Mrs. Copp then established a studio in Chicago. She has modeled portraits of a number of prominent citizens of that city, besides many ideal works. …Mrs. Copp has made several pieces of statuary for the World’s Fair. Among them is “Maternity,” one of the six figures for the Illinois building. Her portrait relief in bronze of Miss Harriet Monroe will be placed in the general art exhibit of the Woman s building. A portrait bust of her grandfather, Rev. John Rankin, will be shown in the historical exhibit of the Ohio building. Other exhibits for the Illinois building will consist of a marble statue of little David Wegg, the son of the president of the Union Pacific Railroad, and a bust of Mother Eagan, who is well known for her work among the fallen women of Chicago. A fine bronze bust of Mrs. Potter Palmer will be given a prominent position in the gallery of honor in the Woman’s building. The largest figure ever built by a woman is called “Pele, the Goddess of Fire,” and is twenty-five feet high. It is the conception and creation of Mrs. Copp, and illustrates a romantic Hawaiian legend. It will be placed over the entrance of the Hawaiin [sic] cyclorama on Midway plaisance. The figure represents a woman seated upon a descending wave of lava; an upraised hand grasps a firebrand, while in the other is a handful of rocks which have the appearance of being cast into the sea. 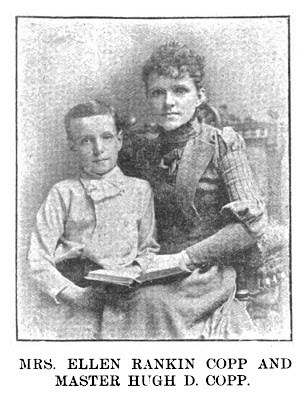 Master Hugh D. Copp, the young man seen in the illustration, is the only son of Mrs. Copp. From his earliest childhood he expressed a desire to be a sculptor. When eight years of age he modeled a swan from memory, which was seen by first-class artists and pronounced a marvelous production. His especial delight and studies are the creation of original Brownies. He has presented the children’s room in the Woman’s building, with a panel in plaster of Brownies indulging in a hurdle race. The Kindergarten Magazine, April 1894, said Rankin received $300 to further his art studies. A profile in the National Cyclopedia of American Biography (1898) said: “…In 1894 she went to Munich for one year studying in the Fehr School. 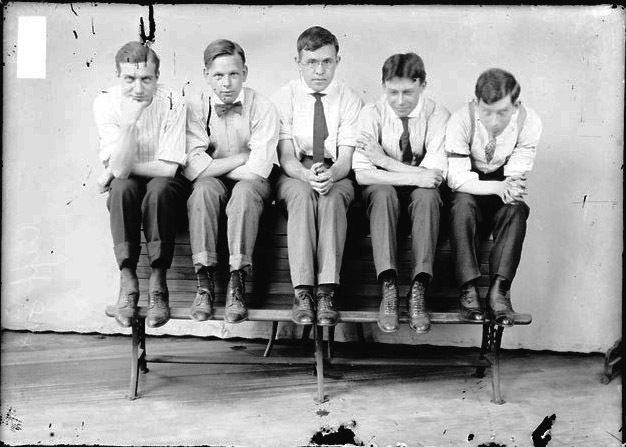 While in Munich Mrs. Rankin took a studio, and modeled an ideal group, ‘The Nation’s Strength,’ which attracted much attention at the annual salon, and was purchased by the American consul….” The Chicago Tribune, December 16, 1894, published a letter from Rankin. (ProQuest summary: Hugh Copp, the Pullman boy, who won a prize at the World's Fair for the “Brownie” panel, exhibited in the Woman’s Building, is now in Munich studying art. He is accompanied by his mother, Mrs. Ellen Rankin Copp, the well-known sculptor.) A New York passenger list recorded the return of Rankin, his mother and 7-year-old brother, Ralf, on July 20, 1895. Tragedy came when his father attacked his in-laws as reported in the Chicago Tribune, June 29, 1897. (ProQuest summary: William H. Copp, formerly of the glazing department of Pullman's Palace Car company, crazed because of the estrangement of his wife, tried yesterday to exterminate the family of her venerable father, Dr. Andrew C.) This event was probably the reason why his mother changed her name to Ellen Houser Rankin. His middle name, Doak, can be traced to his maternal grandfather’s older brother, Samuel (1823–1897), who was married to Julia Doak (1824–1881), according to the family tree. The 1900 census recorded the mother and son in Indianapolis, Indiana at 2440 Shelby Street. She was a sculptor and he a newspaper artist. Also residing with them was artist Arthur S. Covey, who was a year older than Rankin. The family tree said his mother passed away August 8, 1901 and was buried in Atlanta, Illinois. 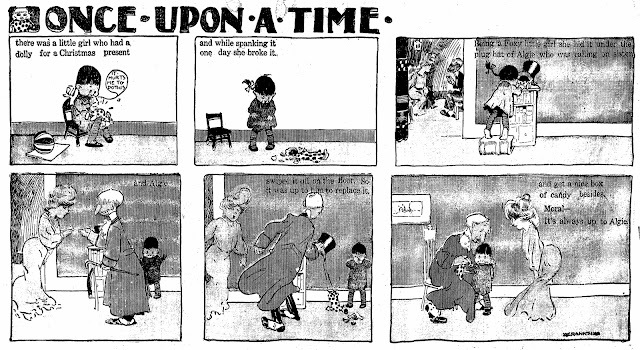 The date when Rankin moved from Indianapolis to Cleveland, Ohio is not known, but his illustrations and strips appeared in the Plain Dealer: Mother Goose Magic Pictures (April 6–July 20, 1902), Don Quixote in Ohio (June 21–August 16, 1903), Kenilworth DeDoghouse (September 27–November 8, 1903), and Three Little Men of the Woods (April 24, 1904–April 9, 1905). His next move was to Chicago, where, beginning in 1907, his work appeared in the Chicago Daily News in over a dozen different series, including Lord Longbow (January 9, 1909–August 23, 1915). The Library of Congress has a photographic collection, American Memory, which has photographs from the Chicago Daily News, It’s possible that Rankin is one of the five unidentified artists in the circa 1907 photographs. In 1910 he was reunited with his maternal grandmother. The head of the household was Paul Hermes who was married to Louiza Quindaro Rankin, the younger sister of Rankin’s mother. Also with them was Japanese servant, “Eazo Nikawagawa”, an Art Institute student. They all resided in Chicago at 1246 East 46th Street. On December 20, 1914 his grandmother passed away. 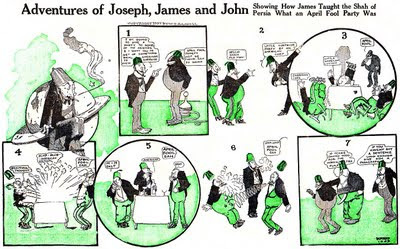 He contributed to Cartoons Magazine, April 1917, “Before Adam, and After”, and February 1918, “Deviltry”. His service in the army began March 1, 1918. He illustrated books including The Camp Fire Girls in Old Kentucky (1919) and Johnny goes a-hunting (1925). Hugh Rankin Rankin was an interior illustrator for Weird Tales, and did a fair amount of Howard illustrating. He’s on this list because Howard himself said, “I am sort of a fiend about Rankin’s illustrations myself…” Howard meant to collect Rankin’s drawings of his work and display them on a panel. What display THAT would make at the Howard House! Most of the illustrations were signed “Hugh Rankin” or initialed “HR”. Science-Fiction: The Early Years (1990) said he used “Doak” as a pseudonym. There are a few illustrations credited to “Quindaro” (his aunt’s middle name) which, I believe, was his other pseudonym. He has not been found in the 1930 census. It's not known when he left Chicago for Los Angeles, California. His uncle and aunt, from the 1910 census, were listed in the 1939 Los Angeles City Directory at “827 N Rampart blvd”. He shared that address with them in the 1940 census, which said they were there in 1935. He had four years of high school and was a freelance illustrator. About three weeks after the census enumeration, his aunt passed away May 13. His uncle followed on August 28, 1949. Cat. © 1c 2Sep47; GU7774. Dog. © 1c 2Sep47; GU7775. Elephant. © 1c 2Sep47; GU7779. Fish. © 1c 2Sep47; GU7777. Hippo © 1c 2Sep47; GU7776. Parrot. © 1c 2Sep47; GU7778. In Witchcraft & Sorcery, number nine, 1973, E. Hoffman Price wrote about his meetings with Rankin, who had illustrated one of his Weird Tales stories. 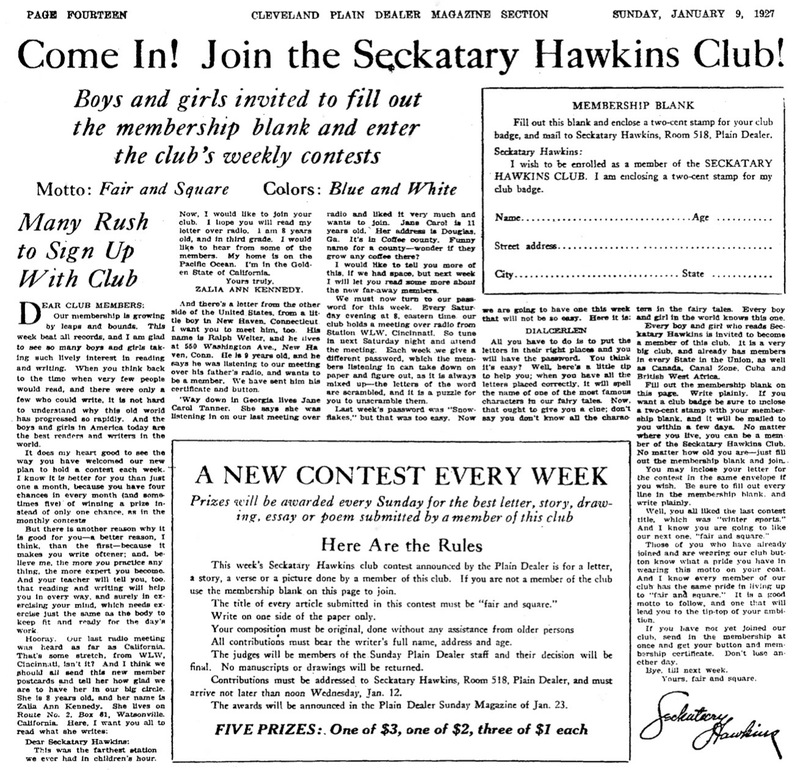 The last time Price saw Rankin was January 3, 1952, at his Los Angeles home, 446 North Occidental. Mystery #1 -- Who's on First? For starters, the comic strip version of Candy debuted on October 2 1944, distributed by the small Chicago Times Syndicate. A comic book version of the same character, apparently drawn by the same cartoonist, Harry Sahle, debuted in Quality Comics Group's Police Comics #37, dated December 1944. So whose version is the original, and who owned the character? As comic books are typically dated three months in the future of their actual shelving date, the comic book Candy and the comic strip Candy debuted almost simultaneously. As a backup feature in Police Comics, I don't see any indication that Candy was expected to set the world on fire by any means. Her introduction didn't even make it into a cover blurb. And in the one promo I have for the Candy newspaper strip, there is no mention of her appearances in comic books. So why was this particular character, out of the plethora of new characters being created for comic books every month, chosen as a multimedia starlet, but not marketed as such? 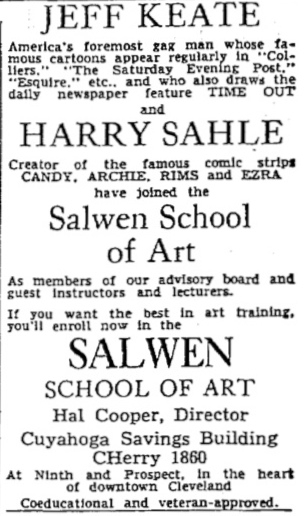 While the comic book version of Candy was apparently credited solely to Harry Sahle, the comic strip version offered credits to Sahle plus (presumably) a writer. Said writer's name seems to be impossible to pin down. 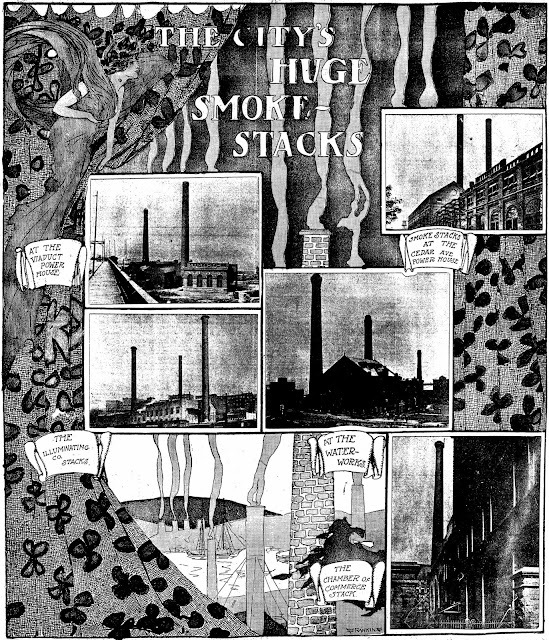 According to my run of the early Candy strips from the Columbus Dispatch, the feature was by "Sahle and Goggin". According to Ron Goulart, who is no slouch when it comes to accuracy, the writer was named Ed Groggin. And to cap things off, various and sundry websites which purport to impart comics history tell us that the writer was Elmer Groggin. So which was it? I asked Alex Jay to do some sleuthing in the genealogical world and he can't come up with any likely candidates. Mystery #4 -- Never on a Sunday? Okay, here's a minor one. Just to give us a breather. According to Dave Strickler's Editor & Publisher index, in which he sometimes inserts an extra bonus factoid about a strip that isn't sourced from the E&P directories, he says that a Sunday strip version of Candy began sometime in January 1945. I have never found any other evidence that there was a Sunday strip of the feature, and no Sunday was ever indicated in the E&P directories. What was Strickler's source for this item, and does it hold any water? Here's another quickie. 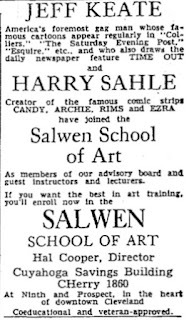 Since Harry Sahle apparently was happy to take credit on his comic book works, signing them regularly, why is it that he never seems to have bothered to sign the comic strip? Surely the prestige of being at the helm of a newspaper comic strip was not lost on Sahle? Maybe not a full-fledged mystery, but odd nevertheless. So let's say you're Harry Sahle, and your time is divided between drawing a newspaper comic strip (the very definition of the big-time to most cartoonists) and drawing a backup feature in Police Comics. Then, presumably for lack of time, you had to drop one. Which one do you drop? Your answer, of course, is to keep the newspaper strip. Even a not particularly successful newspaper strip probably pays better than backup stories in comic books. And the newspaper strip could offer a bright future if more clients sign on. Comic books certainly didn't offer cartoonists any realistic promise of fame and fortune. But apparently Harry Sahle didn't see things the same way. No, his credit did not survive on the strip into 1946, but he apparently continued working on the comic book stories. We know that Harry Sahle left Candy, presumably taking that mysterious Goggin/Groggin fellow with him. Next question is, when did it happen? Since Sahle didn't bother to sign the strip, that's a tougher nut to crack than it should be ... and it doesn't help that I had some very sloppy notes on the subject. Ron Goulart says Sahle "stayed with the strip through 1945." But according to my book, Sahle's last strip appeared June 2 1945. Problem with that is that I failed to cite my source. That turned out to be a lucky break, because in rechecking based on online newspaper archives, I found that I had made a pretty big error. I looked for the new creator to start signing in the Wisconsin State Journal, and found the first signature on June 3 1946. I think that however I got that 1945 date, I was a year and a day off, and the credit change I was supposed to be documenting was to the debut of the new creator, not the end of the original one. Now that doesn't really get us an end date for Sahle, but looking at the strips, I'm going to basically go along with Goulart in guessing a late 1945 end. The changeover certainly isn't obvious except for some subtle design changes to Candy herself, and style changes from day to day indicating a creative team in flux. I suppose that Sahle got enough help on the strip that he and his assistants and ghosts all sort of melded together in that Quality Comics house style. Even when we get to June 1946, when the new creator begins signing, the change in art style is certainly not changed like a light switch by any means. Goulart mentions that Bernard Dibble ghosted some sequences in 1945. According to online sources, Dibble was working at Quality Comics in this timeframe, so perhaps he did lend a hand. That goes to show, I think, that the bullpen at Quality Comics was the real source of the strip when you get down to brass tacks. So what about that new creator? As of June 3 1946, someone named Tom Dorr began signing the strip. If we search around the web for Mr. Dorr, we find a painter of Western subjects by that name, and several websites that discuss the strip Candy say that this is the same Tom Dorr who drew the strip. Sorry, but no. I asked Alex Jay to see if he could find a birthdate for the painter Tom Dorr, and he came back with 1950. So that puts the painter Tom Dorr about as far out of the running as you can get. But thanks, you websites, for throwing out that red herring without so much as an "I think" or "maybe" clause in sight (yeah, I'm lookin' at you Lambiek). That still leaves us with a named but background-less Tom Dorr. Alex Jay's research yielded no artists of the appropriate age by that name in the genealogical records. He did, however, find in the Grand Comics Database a note that Tom Dorr is actually a pseudonym of Russell Stamm. But does that make sense? Well, maybe. Russell Stamm was serving in the military until late 1945, during which time his modestly successful comic strip, Invisible Scarlet O'Neil, was ghosted. When he got back from the war, it seems a pretty reasonable assumption that he took up where he left off with his own strip. However, both his strip and Candy were produced for the same small syndicate. That seems like a pretty big coincidence. There's also the fact that Tom Dorr's signature has the same curlicue on the first letter of the surname as Stamm's, not to mention the repeated final letter. More coincidences? Goulart hedges his bet. He says that Tom Dorr "drew very much in the Russell Stamm vein." I'm going to go farther. My proposal is that Russell Stamm returned from his wartime adventures and got right back to work on Invisible Scarlet O'Neil. But perhaps he had a little free time to help out with Candy. Let's shift focus a bit, though, to Mr. Stamm's wartime ghost, who did a plausible imitation of his style. This fellow would seem to have now been without portfolio, as they say in the governing biz.Why not have him take over Candy from this gaggle of cartoonists in the Quality Comics bullpen? Maybe Stamm could lay things out and nameless ghost could do the finishes, or some such arrangement? Together they could call themselves by a house name, Tom Dorr. But who was this ghost guy? Well, it might have been Emery Clarke, who later ghosted, and then got co-credit with Stamm, on Invisible Scarlet O'Neil. However, there is no documentation that I know of that suggests he was the Scarlet O'Neil ghost during the war years. And there's reason to think, at least in my mind, that we could have a different ghost here. My reasoning? Clarke had a habit of drawing women with rather ridiculously long necks. I do not see that sort of conceit in the 1946 strips. On the other hand, however, that odd stylistic tick of Clarke's might not have appeared in his art until much later, or Stamm's layouts might have steered him away from indulging his neck fetish. What I can say just about for sure, and you know I never make art IDs lightly, is that by 1948 the art on Candy has morphed to the point where I can say with 90% certainty that Emery Clarke is at the helm. Those long necks are just too obvious to be ignored. Compare to these Scarlet O'Neil strips from 1951, which I believe were ghosted by Clarke. The interesting thing about our new cartoonist is that he is obviously quite enamored of Harry Haenigsen's comic strip, Penny. The whole tone and art style of Candy changes to mimic that strip. Sometimes the strips look so similar that if they both appeared on the same funnies page, you'd only be able to tell them apart because Penny is a redhead and Candy is a brunette. Candy's teenage pals, who used to be constant co-stars, have mostly moved offstage so that Candy's foil is her dad -- just like Penny. Who is this Haenigsen imitator? Well, I guess my sleuthing tank has run dry. I have no clue, and I've never heard anyone else venture a guess. At the very end of 1950, December 30 to be exact, Candy's syndicate, which was now Field Enterprises after the Sun and Times merged back in the 40s, decided they'd had enough. But that wasn't the end of the story. Candy continued on for over three years, until sometime in 1954, distributed by a syndicate I know absolutely nothing about, Sterling Features Syndicate. This was Sterling's only known feature, and I have come upon not so much as a whisper about it in Editor & Publisher or elsewhere. One possibility is that Sterling was a self-syndication company for our anonymous Haenigsen imitator,since his style remains on the strip until the end. But if so, why not start signing the darn thing with your real name if you're the chief cook and bottle-washer? An alternate guess is that Sterling was run by Quality Comics. With superheroes on the wane, and teenagers, including shapely girl-type teenagers, a new genre that was selling well, Candy was evolving into an important property. She had even gained her own title in 1947, and it lasted until 1956. So was this newspaper strip now being produced again in the Quality bullpen? Was Quality in such dire straits that they needed to scrape the barrel for syndication money with this property? It would take someone with way more comic book knowledge than I have to provide an answer. Perhaps a Quality Comics expert could even offer an ID of that Haenigsen imitator. Volunteers? After posing all those mysteries, allow me to finally offer a solution to one. There are websites around the 'net that talk about the comic strip Candy having run for 25 years, or say that Tom Dorr produced the strip into the 1970s, etc. That's all plain, unadulterated bunk. What happened is that the Sterling Syndicate portion of the daily strip run was sold off to a few bargain basement syndicates, who then sold the Candy material in reprints. I know of two outfits (or maybe they are two names for the same outfit) that did this reprint syndication. 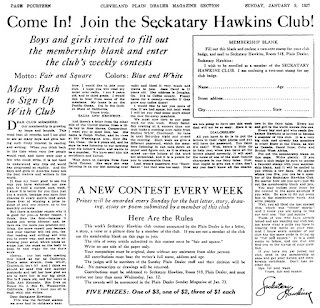 There was the National Weekly Newspaper Service offering in the early 1960s, and the Community & Suburban Press Service in the 1960s-70s. No new material was produced past the mid-50s, I promise. Tomorrow: Alex Jay weighs in with an Ink-Slinger Profile of Harry Sahle. Just to muddy the waters, to my amateur eye the October '44 and May '45 strips look like they were drawn by the same artist, but the March '45 strip sure looks like it was drawn by another hand. I agree that the style in 1944-45 shows that there were frequent assists. 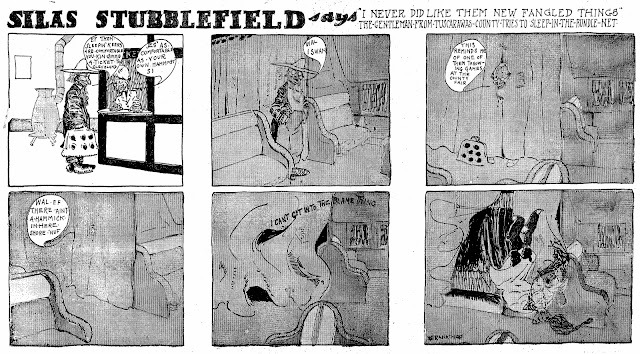 I get the feeling the strips probably made the circuit in the Quality Comics bullpen, with Harry Sahle's involvement varying tremendously in degree on any given date. My take on that March strip is that it could well be partially paste-ups from earlier strips. I can't answer all your questions regarding "Candy", but I can clarify that Ed Goggin was indeed a fairly productive comic book writer in the mid-Forties. Most of his credits come at Archie Publications on everything from the titular character to similarly themed humor features such as "Ginger" and "Suzie". Harry Sahle was also working at Archie around the same time and it's not a stretch to assume that they connected there. It's also a good guess that neither was anything more than a hired hand, replaceable whenever with whomever the syndicate chose. Given the choice, I'd say that Sahle (and Goggin) would have stayed with the strip rather than the far less profitable and prestigious comic book, but it probably wasn't either man's choice to make. Keep up the great work, Allan! Thanks Ken -- Ok, Ed Goggin it is. Nice to put a rest to that one. I've done a bit more thinking about "Candy" strip v. comic book chicken-or-the-egg situation and I'd offer that it's likely that the strip bore the comic book. Using a bit of reverse engineering, neither Goggin nor Sahle had many--if any--credits with Quality Comics prior to "Candy". This indicates to me that the strip idea originated elsewhere (either with the creators or the syndicate) and found a home in the comic books as a secondary venue. I also don't necessarily believe that the various ghosts on the strip came by way of Quality Comics. By the mid-Forties, much of Quality's material came out of Jerry Iger's shop and neither Goggin or Sahle had any connection to it as far as I can determine. 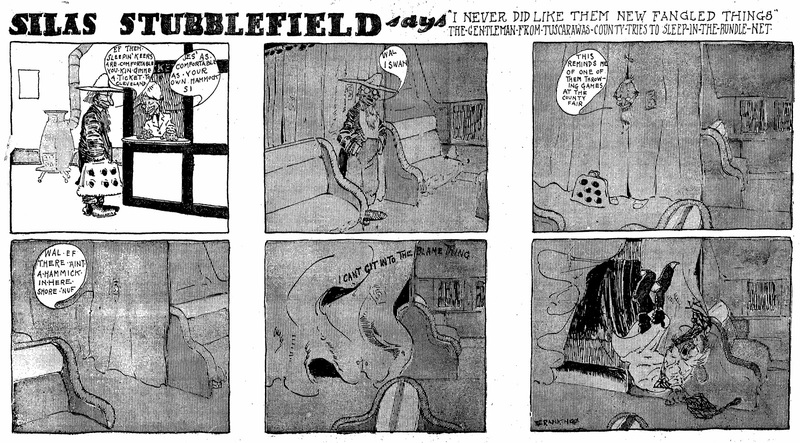 I'd offer once again that the strip was owned by the syndicate and they replaced the creators as they saw fit. If "Busy" Arnold, owner of Quality, had an interest in the strip, it's news to me. I've done a bit of research into Arnold over the years and I've never come across a reference connecting him to the strip. That doesn't mean none existed, but based on my research, I doubt it. Anyway, those are my thoughts, Allan. I hope I haven't made the mysteries surrounding "Candy" more mysterious! Many thanks for expending some brain juice on these issues, Ken. Can I also assume since you didn't mention it that "Sterling Features Syndicate" does not tie Candy to Quality in any known way? I really have to wonder what in the world kind of copyright situation there was. If Sahle and Goggin sold this independently to the Chicago Times, who would have held the copyright, how did Quality get away with doing their version? I know there was no copyright to Quality on the newspaper strip, and I assume there was no ChiTimes copyright shown on the Candy comic book stories. Did everyone consider this such a lame property that they just didn't care much? Weird. I've never heard of Sterling Features Syndicate nor of any connection it may have to Quality Comics or "Busy" Arnold. Of course, that doesn't mean there wasn't one,just none that I have found. I've done some checking of both the "Candy" backup feature in POLICE COMICS and the CANDY comic itself. I haven't found a Chicago Times copyright on either. Given Arnold's ongoing relationship with the Register and Tribune Syndicate with "The Spirit" strip, it seems odd that he would concurrently own another strip through a competing syndicate. And it should be noted that Arnold had no problem putting his name as the copyright holder on "The Spirit". Why then would he forgo it on "Candy" if it was his? My two cents (or less): if there is a connection to the Quality team, could the last Tom Orr have been Gill Fox? I see a similarity to his work at Quality and he was heavily influenced by Haenigson for his dvertising work in the late forties. How does the run of Candy connect to the start of his own girly strip Jeannie? That's Jeanie, with one n.